In most organizations, the most challenging problems are those that span multiple teams, departments, or divisions. For example, many companies struggle to create a seamless customer onboarding experience, or a quote to ship process, without any hiccups. Why are these goals so difficult? Largely because no single group can make them happen alone. 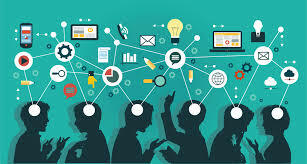 Cross functional collaboration is difficult partly due to communications barriers, different working styles and workflows, and different tools used by each group. Software designed to remove these obstacles and grease the skids of cooperation provides significant help. When it comes to improvement, cross functional team collaboration is especially important. Getting people from across your organization working together to solve problems that plague them all ensures that you take diverse approaches and achieve the best solutions. Here are a few of the features you should look for if you want to remove the silos and get your teams working as one. Leveraging a single solution for improvement work across the board makes it much easier for diverse teams to work together. Everyone comes to speak the same language, so to speak, and each group has equal access and insight into the work of others. You develop a standard methodology for each type of improvement, leadership has a consistent way to facilitate implementation and promote engagement, and you're actually able to measure and share results. Most leaders struggle with the fact that while a few employees get heavily involved in improvement, others remain consistently disengaged. The best software solutions allow managers to see who is working on what, delegate tasks, and manage the workload of all employees. This helps them pull people into improvement work and avoid overburdening the usual suspects. Improvement is usually iterative, so it is important that comments, metrics, and task progress are tracked and easily accessible to all involved. Look for a solution that makes it easy for all of the information about any given improvement project, including files and images, to be kept in one place. Ideally, it will provide smart notifications that integrate with email and be accessible on digital boards for use in face-to-face meetings. Modern collaboration software makes managing teams a breeze. Leaders should have real-time visibility into the progress of projects and receive email alerts and notifications when milestones are achieved, or when assignments are missed. They'll be able to keep track of all key metrics in a single place, and to easily share those metrics with their supervisors. Some improvement projects are of great interest to stakeholders who are not directly involved in the work, such as executive leaders and department heads. Collaboration software gives them a view into what is happening with each project without the need for manual reports or unnecessary meetings. On the other end of the stakeholder spectrum, the people who submit ideas for improvement will be kept in the loop throughout the entire implementation process. Teams have used physical huddle boards for years to make meetings run more smoothly and quickly. Today’s collaboration software includes digital boards, making it easier than ever for teams to collaborate efficiently, no matter if they are all in the same building, or distributed around the world. With the right cross-functional collaboration software in place, your organization can get to work on those stubborn issues that never seem to go away. Together, teams can tackle them one at a time and smooth your progress toward your most important strategic goals.